This past Sunday we had a lovely family luncheon to celebrate Dad's 80th birthday. He is pretty good for 80, considering he has very bad heart disease and is an insulin dependant diabetic. We think he enjoyed his day - he is not very demonstrative. 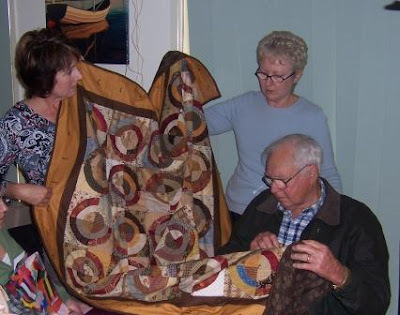 Here he is receiving his quilt. He seemed to like it very much, and was concerned he might dirty it, like spilling his dinner on it or something. I reassured him it was meant to be used and was fully washable. 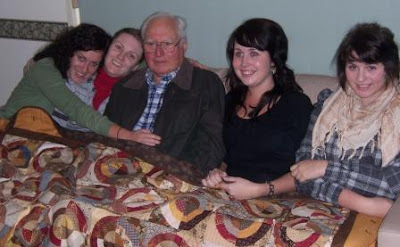 This is my sister on the left who just loved the quilt, and we gave it to him as a gift from all the family. There is just my sister and I and she has 3 children and I have 2. Here he is with four of his five grandchildren - Nicholas, the only boy amongst them - was on tour with his rock band "Phalanx". I ended up tying the quilt with six strands of brown embroidery thread (I was in a hurry). It turned out to be just the thing to finish this type of quilt off. Next Project?? Maybe I'll start on the Kaffe Fassett I have in mind.